And more new stuff! This comic is the first to have been sketched in Corel Painter Essentials, and I really like how the program's working so far. I also switched fonts to some that I had purchased as part of a 10000 fonts pack. The canvas size for this comic is a lot larger than previous ones (with the exception of the longest comic ever, which is, I believe, exactly the same height). The longer format gives me a lot more space to work with in terms of buildup and things, so while it takes a lot longer (8-12 hours per comic), I think I'll use it more often. Perhaps long comics on wednesdays, short comics on some other day? 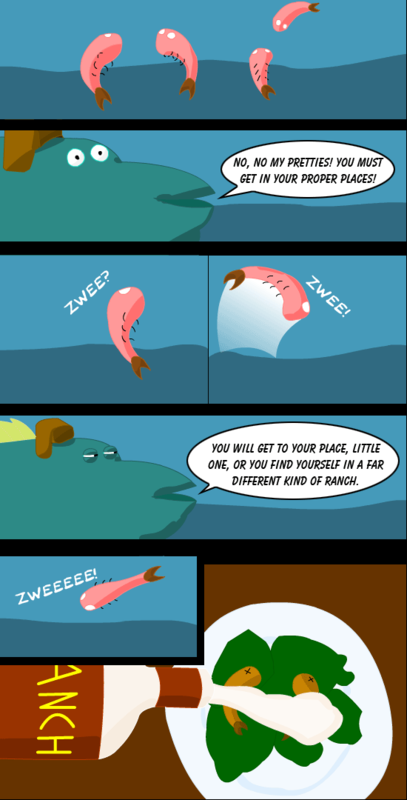 The shrimp in this comic are relatively dumb creatures: think ocean sheep, or something. Not the best things to keep rigidly in order, all organized, thus making the Particular Parrotfish's choice of vocation rather poor. The Parrotfish will show up again, in his inifintely ordered and clean and proper and all together and why isn't this where I left it ti's over two centimeters OH NO HELP capacity. Fifth panel. Image of nightmares. That is all.